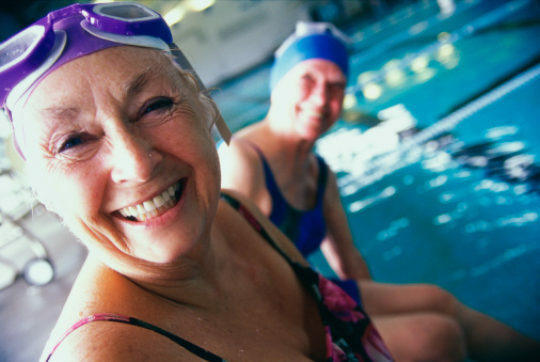 Exercising is the single most important thing that you can do to keep yourself healthy and to delay the aging process. Keeping physically fit may add up to two to three years to an individual’s life span. Stretching increases blood flow and gets your body ready for exercise. Stretching also improves flexibility, eases movement, and lowers the risk of injury and muscle strain. A warm-up and cool-down period of 5 to 15 minutes should be done slowly and carefully before and after all types of exercise. Stretching can help loosen muscles in the arms, shoulders, back, chest, stomach, buttocks, thighs, and calves. It’s also very relaxing. Which types of exercise are best? Aerobic exercise: Improves cardiovascular fitness and muscle tone. This type of exercise includes activities such as walking, running, swimming, cycling, dancing, rowing, and cross country skiing. Weight training (resistance) exercise: Promotes muscle strength and flexibility. Both aerobic and weight training exercise can improve balance. Recent studies have suggested that Tai Chi, an ancient Chinese exercise regimen, may be even more effective than traditional exercise programs in preventing accidental falls in older individuals. Older individuals, especially those who have led a very sedentary lifestyle, should check with their doctors before embarking on a vigorous exercise regimen. Additional testing (such as a stress test) may be necessary. No matter how long, short, or intense the exercise regimen, always include a warm-up and cool-down period. This step will help decrease the chance of injury. Wait at least two hours after eating before vigorous exercise. Exercise only when feeling well. Drink plenty of fluids both before and after exercising. Wear loose, comfortable clothing that allows you to move easily. Supportive footwear designed for exercise is a must. Set realistic and safe goals. Avoid exercising outdoors in very warm or very cold weather. If you experience any of the following symptoms, stop exercising immediately: chest pain or discomfort, dizziness, palpitations, or excessive shortness of breath. Find an exercise regimen, instructor, and/or program that you like, and have fun!